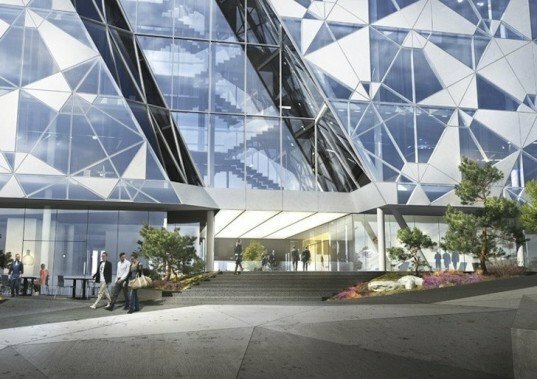 Snøhetta recently completed Deloitte’s newest office complex, a mixed-use building designed as part of the Barcode Project in the Bjørvika region in central Oslo. Inspired by the form of a breaking glacier, the building's geometric facade consists of four repeated prefabricated panels that create a distinctive and partly translucent pattern. 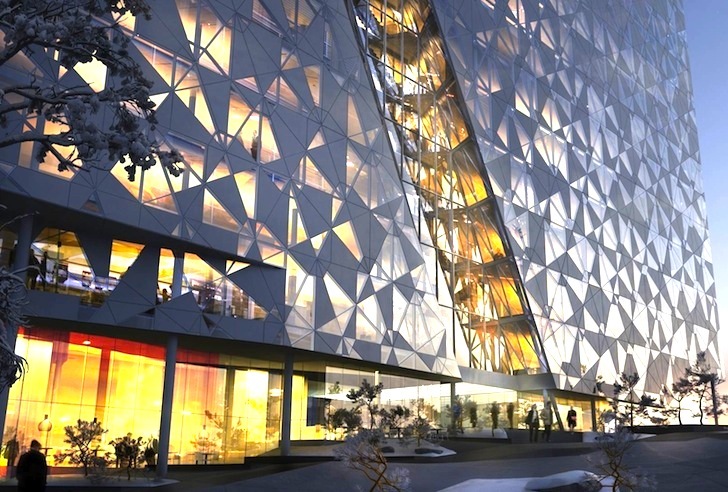 The sculptural and striking office complex is Snøhetta's latest project to be completed in Norway. Wrapped in a distinctive, fragmented snow-white facade, the sculptural Deloitte building was commissioned as one of the main Barcode redevelopment buildings in 2007. Titled the Barcode Project, the development’s master plan included a set of architectural guidelines such as height restrictions and requirements for a tall, narrow building profile that promoted transparency and light penetration. Within the approximately 215,000 square-foot Deloitte office building, the architects stacked ten floors of office space on top of two levels of retail and restaurants. The building’s uppermost three floors consist of canteen and conference rooms with adjacent green roof terraces. To comply with height limitations, Snøhetta split the building volume in two and positioned the lower volume closer to street level. The designers also carved out a vertical glass slit in the facade to create a glass atrium that overlooks the bay. As an artistic pursuit, I have for many years been developing a similar systematic fragmented facade concept, but one which is based upon cycles of polar opposites and developmental phase cycles, which lend themselves to being prefabricated and juxtaposed in a variety of aesthetically satisfying ways, with the possibility of being related to the proportions and dimensions of required surfaces, and if desired, particular to each one. It is inspiring and pleasing to see someone successfully working architecturally in a similar dynamically fragmented way. Wrapped in a distinctive, fragmented snow-white facade, the sculptural Deloitte building was commissioned as one of the main Barcode redevelopment buildings in 2007. Titled the Barcode Project, the development's master plan included a set of architectural guidelines such as height restrictions and requirements for a tall, narrow building profile that promoted transparency and light penetration. Within the approximately 215,000 square-foot Deloitte office building, the architects stacked ten floors of office space on top of two levels of retail and restaurants. The building’s uppermost three floors consist of canteen and conference rooms with adjacent green roof terraces. To comply with height limitations, Snøhetta split the building volume in two and positioned the lower volume closer to street level. The distinctive facade was created by a pattern of four prefabricated panels. The designers also carved out a vertical glass slit in the facade to create a glass atrium that overlooks the bay.